Can App-based Monitoring Tell Me When My Teenager Got Home? The answer is yes. App-based monitoring is the best tool available to keep homeowners constantly aware of who is entering and exiting their homes and during what times. An app on your smart phone allows you to review the systems history of events. And by receiving instant notifications via text and email, app-based monitoring is working for you 24/7. Having this kind of access, to your home, at your fingertips, is the ideal answer for many everyday questions. Parents are able to check and make sure their children arrive home safely from school or that their teenager made it home by curfew. If someone needs access to your home, while you are not there, you can now arm and disarm it for them through your user friendly app. With app-based monitoring, the days of giving out your alarm code are a thing of the past. It is also perfect for those who love to travel. If you’ve hired a pet sitter or someone to come in and check on your home, the app allows you to see when they arrived and when they left. Using this technology, an app-based monitoring client discovered that the person hired to walk their dog wasn’t doing so, and they had been using that persons services for over ten years. By being aware of what is happening at your home, while you’re away, you can leave worry and concerns behind. Plus, you always have the 24/7 protection of CSS Alarms Nashville alarm monitoring service watching over your home. Check the Status of Your Alarm System – from ANYWHERE! By allowing the user to remotely arm and disarm their system, you no longer have to question whether or not you remembered to arm the alarm system before leaving the house. App-based monitoring allows you to check the status of your alarm system wherever you are, and if you did forget, the problem is solved at the touch of a button. And just as easily, your system can be disarmed as you pull into your driveway avoiding that rush to the keypad. 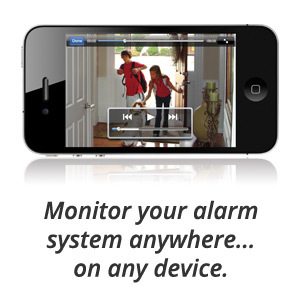 App-based monitoring allows your home alarm system to conveniently work for you at the times you need it the most. You can even Engage or Disengage individual Deadbolt Locks from your smartphone – from ANYWHERE! This allows you to manage your household from anywhere and never again give another KEY or ALARM CODE out to anyone. This innovation is one of the largest jumps in security and convenience that our industry has witnessed in years. Interested in Switching to App-based Monitoring? If you would like to switch to App-based monitoring and save some money, give us a call today to see what special pricing you qualify for!